Walk easy with a great fit and all-around softness in L.B. 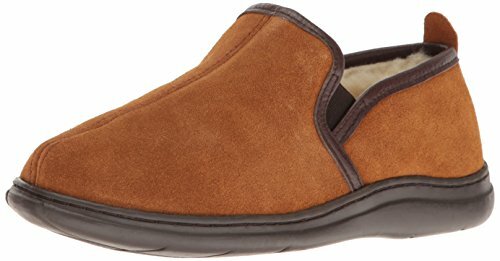 Evans Men's Klondike Slip-On Slippers Soothe your tired feet with this incredibly comfortable slipper. The genuine suede upper, with a leather trim collar, is lined with soft, cozy acrylic boa. Plus, it features twin elastic inserts that stretch for a great fit and easy on / off. The cushioned memory foam insole softens your steps, while the durable thermoplastic rubber outsole helps keep you steady indoors and out! Elastic gore offers a great fit. Grab a pair today! Measurements: Weight: 11 oz Product measurements were taken using size 7, width EEE. Please note that measurements may vary by size. If you have any questions about this product by L.B. Evans, contact us by completing and submitting the form below. If you are looking for a specif part number, please include it with your message.